Peggy's Cove Lighthouse, enhanced by the rugged beauty of its location, can justly be describe as "beautiful Peggy’s Cove Light." Whenever I go to Peggy’s Cove, or hear its name, I think about what the late Charlie Labrador told me about it a long time ago - he was then Chief of the Acadia Band. It happened early one morning in the spring of 1976. "Over the weekend the wife and I were over to Peggy's Cove to see the place. Ever since I've been trying to figure out why the government didn't make it into an Indian reserve. It’s a barren rocky isolated piece of land that would have made an ideal addition to the barren rocky pieces of our land they so generously returned to us." The only answer I could come up with was that they somehow foresaw the tourist potential and saved it for themselves!" 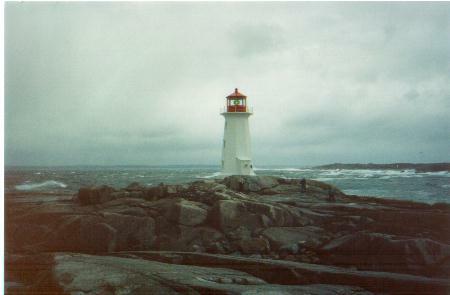 The first lighthouse was built in 1868 at the entrance to Saint Margaret's Bay. The present was built in 1914, it has not been used as a lighthouse since 1958. However, during the tourist season, its used as a Post Office.